Garlic isn’t an ingredient that people normally associate with soup. It’s a featured ingredient in this Spanish specialty that’s almost puritan in its simplicity. 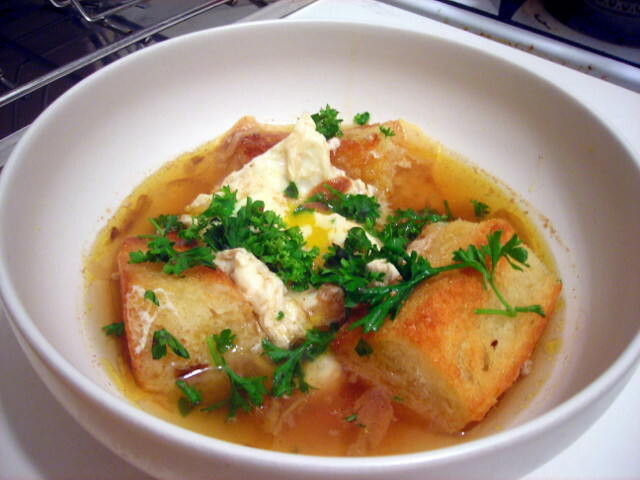 As I’ve posted elsewhere, at it’s simplest, sopa de ajo is just garlic, bread, egg and water. Now, there are other variations that you can use to expand your horizons when making this dish. For example, you can substitute vegetable stock or chicken stock instead of water. Some people like to deglaze with white wine after the garlic is sautéed in olive oil, before adding any liquid. Still others add ham, sherry, cayenne pepper or crumbled stale Italian bread. When you make this dish, make the basic version first so you can get a sense of what it tastes like. Afterwards, you can experiment however you like. Heat olive oil in a large skillet over medium-low heat. Add baguette slices to the pan. Fry bread until golden brown on all sides, about 5 minutes. Lift out with tongs and place on a paper towel-lined plate. Set aside. Heat 2 tablespoons olive oil in a stock pot or soup pot over medium-low heat. When oil is heated through, add garlic cloves to the pot and sauté until cloves begin to color. Watch carefully. DO NOT let cloves burn (or you may need to start over). Stir in pimentón if using. Add water to the pot. Adjust heat to low. Stir. Bring to a gentle simmer and cook, about 5 minutes. Remove pot from heat. Drop in eggs. Eggs will poach in the liquid as the soup finishes cooking. Lift eggs out with a slotted spoon and set aside. Taste for salt if necessary. To plate, arrange baguette slices in a shallow soup bowl. Place a poached egg in the center. Ladle broth against the sides of the soup bowl. Scatter with chopped parsley, then serve at once. Serves 4 as a first course or 2 as a light supper. Great with sherry or a Basque white such as Txakoli. Time: About 30 minutes, including prep. Be sure to fry the baguette first before making the soup. 07 Jun	This entry was published on June 7, 2010 at 12:04 am. It’s filed under food, general, summer, vegetarian and tagged bread, dinner, egg, garlic, quick and easy, seasonal and local, soup, Spanish food, vegetarian. Bookmark the permalink. Follow any comments here with the RSS feed for this post. I love garlic, and have fancied making a garlic soup for some time now. I think it would be good for colds. One of the great advantages of keeping a Mediterranean pantry is that you can feast like a king for roughly the price of a box of pasta. That’s $2 food cost. And leftovers? That’s where imagination comes into play, where you’re provided with the opportunity to make a silk purse out of a sow’s ear. It’s great and I love it. Do tell me how things turn out if you try it.